David Friedman, internationally renowned vibraphonist, marimbist, composer and jazz educator, has his own musical message, born of fascinatingly diverse musical influences. Few jazz musicians can claim as broad a spectrum of performing and recording experience, with such varied musical personalities as Leonard Bernstein, Luciano Berio, Bobby McFerrin, Wayne Shorter and Yoko Ono. Friedman has been heard either live or on recordings with, among others, Joe Henderson, Horace Silver, Johnny Griffin, Jane Ira Bloom, Ron Carter and John Scofield. His compositions are featured on Chet Baker`s award winning Enja release, Peace, with bassist Buster Williams and drummer Joe Chambers. Friedman is also the featured soloist on this recording. In 1977, Friedman co-founded the unique vibe-marimba quartet, Double Image, which was nominated for a German "Grammy". Their album, Double Image, was just re-released as a special edition by Enja Records. Friedman's Enja release Shades of Change, with pianist Gerry Allen, bassist Anthony Cox and drummer Ronnie Burrage, was voted by Downbeat Magazine as "One of the year`s best 20 CDs". Friedman`s trio playing with star drummer Daniel Humair and bassist J.F. Jenny-Clarke, documented on their 1992 live release Ternaire, showcases modern, interactive jazz improvisation, ranging from an agressive driving swing to tender lyricism. Friedman's project with bandoneonist Dino Saluzzi, Astor Piazzola's heir to modern Tango, is a synthesis of American jazz and ethnic improvisation, Gifted bassist, Anthony Cox, completes the trio. This 1996 CD release, Rios, on Intuition Records, has been called "a true work of art" by the Chicago Tribune. 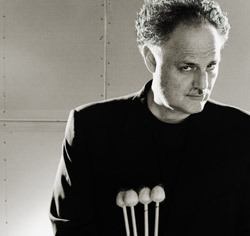 One of Friedman`s most unique accomplishments is his solo mallet recording, utilizing multiple vibe and marimba overdubs, creating richly textured soundscapes. This is the first recording of its kind ever done by a mallet performer and is aptly entitled, Air Sculpture, on Traumton Records. Jazz Friends Review writes: "This music is made of the same fabric dreams are made of. This daring recording is riveting." Germany's Die Woche calls Air Sculpture "a humble masterpiece!". Friedman's project, Other Worlds, is a trio with an instrumentation and sound all its own, featuring the exciting French accordianist Jean Louis Matinier and the brilliant American bass virtuoso Anthony Cox. Their new CD Other Worlds, was recorded in November 1996 for Intuition Records and released in December 1997. It's a spellbinding musical journey, featuring original compositions and improvisational dialogues of incredible depth and beauty. Jazzthetik remarks: "You feel your ears being drawn to the speakers as if by magic! Other Worlds is a true musical adventure". In 2003 Friedman formed his new Trio TAMBOUR, with star german saxophonist, Peter Weniger, and bassist, Pepe Berns.The new CD, EARFOOD, on Skip records, was released in January 2004 and was high in the jazz charts. Just after the release of EARFOOD Friedman was asked by RBB television to moderate the 2004 Berlin Jazz Festival. 2005 saw David touring with TAMBOUR and performing in duo with Fèrenc Snetberger and Double Image. As a composer, Friedman began writing a series of 6 solo marimba pieces, several new vibraphone solo pieces, as well as compositions for mallet ensemble, published by Norsk Musikforlag from 2006 until 2009. In August 2007 David was given a Lifetime Achievement Award for his contribution to the art of vibraphone playing and education at the KOSA international Percussion Festival. In 2008 he was recognized for his life's work at the Ludwig Albert Belgian Marimba Festival. David's new CD with TAMBOUR, Rodney's Parallel Universe for Skip Records, was released to critical acclaiming in March, 2007. Retro, the stunning new CD collaboration with duo partner, saxophonist Peter Weniger, will be released in the fall of 2010 on Skip Records.